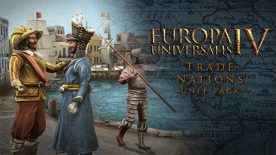 Europa Universalis IV: Trade Nations Unit Pack adds 16 new unique models. Aragon, Genoa, Novgorod and the Hansa will each get four new model, enhancing the visual experience of Europa Universalis IV. Europa Universalis is required to play this DLC.